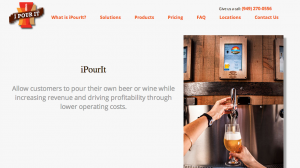 iPourIt combines beer and automation. You can’t beat that combo. I’m a fan of beer. That doesn’t really make me unique in Wisconsin. Lots of people here love beer and people all over the nation and the world love beer. Right here in the Chippewa Valley we have Leinenkugel’s Brewery. They’ve been brewing beer for more than a century. Technically they brewed other things during the ’20s, but I’m sure there was some hush-hush going on. Anyway, if you’re like me you’ve probably waited in line for a beer at a bar, restaurant, game and at some other type of place that serves beer. It’s frustrating. You just want to get your drink or drinks and get back to your group or get back to watching the game. That’s where iPourIt comes in. They’re innovating in the self-serve beer industry. I’m a fan of beer, but I’m also a fan of self-serve and automation in just about all forms. This type of automation obviously cuts down on lines. If you’ve ever been in a Walmart you know that the self-serve checkouts are amazing in almost every instance. No more waiting. And you would think that something like this is cheaper for the server in the long run. If it adds to their profit and to the consumer’s happiness it’s a win-win. They can keep innovating and focusing on creating better experiences and better beers. Normally at this point I would say that I’m going to analyze the iPourIt Blog, but they currently don’t have one. So instead of reviewing their blog I’m going to share a few types of posts I think they could offer to their target reader. The leaders of those businesses are looking for data just about all the time. The executives I have known are always on the lookout for market data. I imagine that people in the industries above would love to have data on popular beers. That’s something iPourIt could potentially share on a blog. It would attract executives. I’ve had executives share blog posts with me that share industry data. They love that stuff. You can even curate industry data and share it, along with your thoughts, in a blog post. Along with data comes trends. iPourIt will have deeply involved in the industries above and they’ll be on the forefront of seeing the big trends. It can be a challenge for a smaller restaurant or bar to stay up on the trends. So the leaders in those organizations look for industry experts for trend information. iPourIt can become one of those industry leaders that its target clients look to for trend information and commentary. Let’s say that people will continue to look for more IPAs this year. That’s information that’s important to the bar owner or restaurant owner. iPourIt could take information from their experiences or they could curate that information from news articles and provide commentary. I can’t say that I’ve seen the iPourIt system in a bar or restaurant just yet. I think they might have something like it at Lambeau Field, but I didn’t attend a game this year. I would love to see it, but I don’t think it’s a big time thing yet. Whenever something is new business owners are going to look for proof. They might believe in it, but it will help if there are case studies and examples to show how the technology is working. A blog is a great place to share case studies of how your system is working. iPourIt could share statistics like increased profits, decreased beer loss and many other things that would be interesting to potential clients. For iPourIt, the target reader is probably a manager, owner or executive. It’s the person in charge of running the establishment like the bar and restaurant. For smaller establishments, the owner is probably the one that will make the ultimate decision, but maybe a manager would be the one to discover the iPourIt opportunity. That’s true with big companies as well. Managers discover and executives decide. But both would be reading posts. So think about what those people are doing every day as it relates to their job. They’re looking for ways to get better themselves and ways to make their establishment better. Don’t limit yourself to your exact industry, which in this case is beer. You can attract the right target reader by writing about the things they care about as it relates to their job. You can earn their trust and because they’re your target client they’ll be interested in what you’re offering. Finally, iPourIt could share company news on a blog. I would imagine that in the next year that the company would be expanding into some great establishments. A short post announcing the introduction of iPourIt into restaurants, bars, stadiums and more is exciting news to share. And you can give a shoutout to your partners. They’ll probably be excited about and would want to share your blog post with their followers on Facebook, Twitter and wherever. That can help expand the reach of your blog. This blog analysis was a little different, but I thought it would still be valuable. Plus I’m a fan of beer and of automation so I had to jump on this opportunity. iPourIt combines those two things and I think it’s an exciting development where there is an obvious pain point for establishments and consumers. I hope they do well and I would love to see them launch a company blog in the near future.